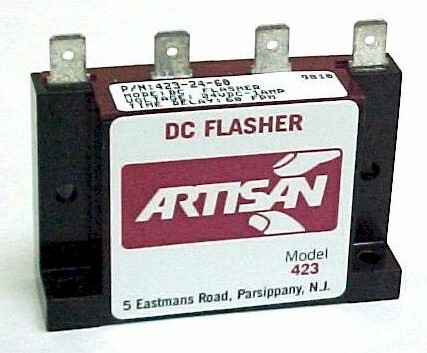 The model 423 is an all Solid State flasher for use in DC circuits only. Capable of flashing a load circuit up to one ampere at a fifty percent duty cycle. Output switch is ON for as long as it is OFF. Flash rates from 1 flash per minute up to 600,000 flashes per minute are available in four operating voltage ranges. The model 423 has internal transient protection devices to assure reliable operation even when driving inductive load circuits such as relays or solenoids. (For AC flashers see the model 4210). Output Rating 1.0 ampere inductive with inrush current to 20 amperes for 100 milliseconds. Flash Rate, Fixed 1-600,000 Flashes per minute. Transient Protection Maximum transient voltage protection is 6000 volts as delivered through a source resistance of 30 ohms with a maximum duration of 8.3 milliseconds. Operating Temperature -20 deg C to + 85 deg C.